June 16, 2017 update: Today marks the 100th day of a hunger strike by two Turkish educators, Nuriye Gülmen and Semih Özakça, in protest at being fired from their jobs as part of the government's ongoing purge of alleged supporters of exiled cleric Fethullah Gülen. They have continued their hunger strike despite being arrested and jailed late last month on terrorism charges. Originally published under the title "Turkey: Jail for Hunger Strike." 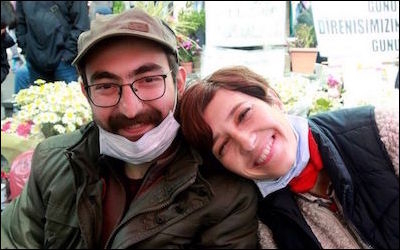 Literature professor Nuriye Gulmen (left) and primary school teacher Semih Ozakca, who lost their jobs in the ongoing purge of alleged Gulen supporters, were arrested for going on a hunger strike. Erdogan has dismissed 150,000 public employees since a failed July 2016 coup attempt. The failure of the authorities to set out clear criteria for the dismissals or provide any individualized evidence of wrongdoing blows a hole in their claim that all the dismissals are necessary to counter terrorism ... Instead, evidence suggests widespread abusive and discriminatory motives behind the purge. We, the undersigned members of the European Parliament, wish to express our deepest concern about the ongoing state of emergency and disproportionate effects thereof on democracy and human rights in Turkey.